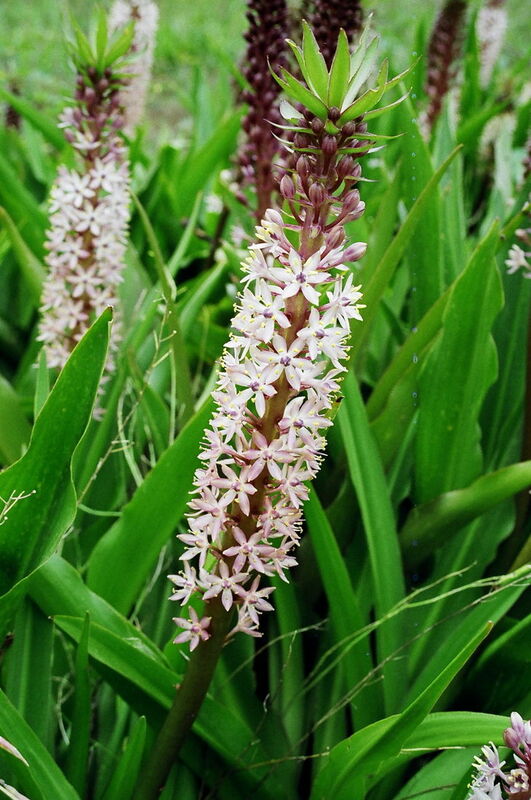 A genus of 15 species all native to Southern Africa, and their common name of “Pineapple Lilies” coming from their spikes of numerous star-shaped flowers topped with a crowning tuft of leaves resembling a pineapple. They mostly have large bulbs and a basal rosette of glossy foliage which is very attractive. They prefer moderately rich soil in a sunny position. Add a small amount of complete fertiliser at the time of planting. Clean up old foliage at the end of Winter and top dress with complete fertiliser. Water once a week during growing season and keep on the dryer side over their Winter dormancy. They make a very good cut flower lasting several weeks in a vase.